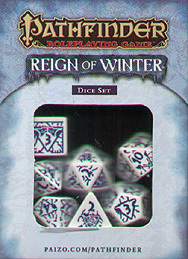 Paizo Inc. and Q Workshop are proud to bring you the 100% official Pathfinder Reign of Winter Adventure Path dice. Each of these 7 (d4, d6, d8, d12, d20, d10 and 1 percentile die) dice bear markings suggestive of frosty magic and arctic adventure. Roll the dice and strike back against the coming cold!